The Hemis reputation among muscle car fans is almost legendary. Its success at the track and on the street rival any engine past or present. For decades driving enthusiasts have loved the Hemi for its power, torque, simplicity, and aftermarket support. When Chrysler brought back the Hemi engine in its modern form automotive enthusiasts were thrilled to have old school power with modern technology. But like any other engine, drivers are always looking for ways to extract more power and improve the driving experience. An aftermarket exhaust achieves both of these objectives. The increased flow improves functionality by allowing the engine to operate more efficiently and produce more horsepower and torque. 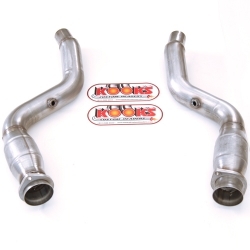 Along with the increased performance an aftermarket exhaust system has a more aggressive exhaust note that can be enjoyed by the driver and onlookers.